Peace, tranquillity, quietness, rest, CALM COMFORT. This popular Irish word encapsulates the sense of serenity that is much striven for in modern life. This is me at my most happiest! One of those rare moments when you find yourself laughing and crying at the same time, whilst experiencing a whole host of different emotions. I'm with 'Suaimhneas' a baby sea turtle whom I adopted (and named) and was very privileged to release into the wild, whilst on a family holiday in Bali on the 26th April 2018. This was all thanks to the hard work and dedication of the team at TCEC, the Turtle Conservation and Education Centre at Serangan Island. 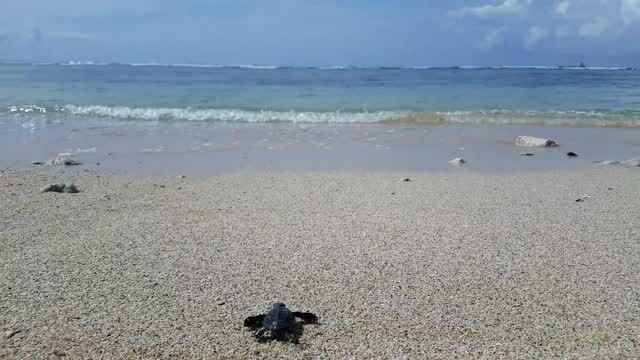 For more than 100 million years sea turtles have covered vast distances across the worlds oceans filling a vital role in the balance of marine habitats. Today human activities have tipped the scales against the survival of these ancient mariners and sadly the majority of turtles are classified endangered. If you ever find yourself in Bali, I highly recommend taking a trip over to visit TCEC, maybe do some volunteer work or adopt a turtle. They are striving to stop the decline of sea turtles and to protect their environments so any help or support is gratefully received and you may get to experience one of those life changing special moments as I did.